One of the many reasons I love living in the San Juan Islands is because there is wildlife around every corner. Today, for instance, I was tiredly walking home after my 9 hours at work, when I heard a distinct kah-ka-ka-ka-ka-ka-ka-kawk! from up above. 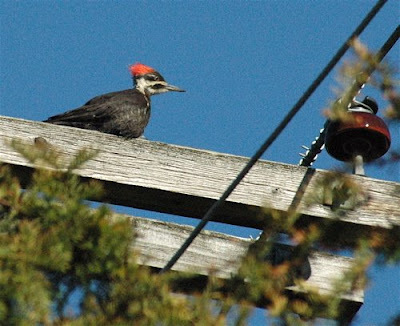 I looked up to find this pileated woodpecker sitting on a telephone pole above me. These are the largest woodpeckers in North America, and always a treat to see. They create large holes while looking for insects and building nests, and can chip away so much wood they cause small trees (or utility poles) to snap and fall. Sorry about that, it's changed! Rhinoceros Auklets - On the Decline?